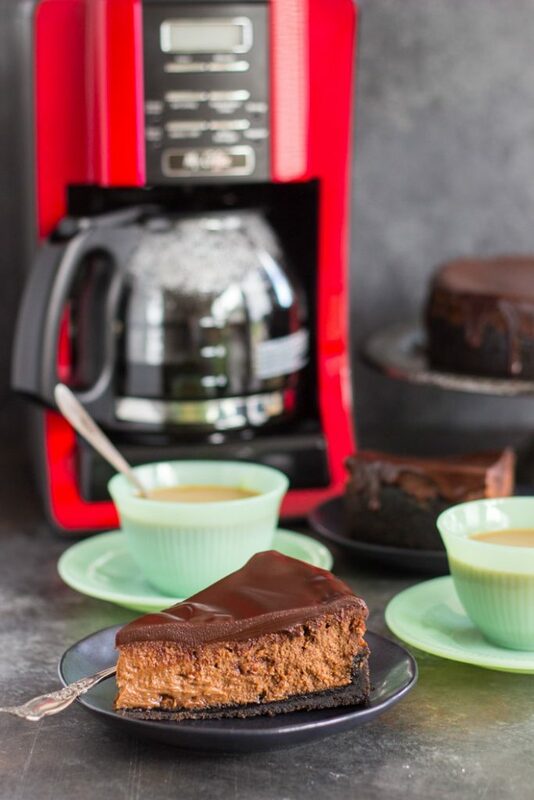 This sinfully decadent Mocha Cheesecake recipe starts with a thick crust of crushed chocolate creme-filled sandwich cookies. 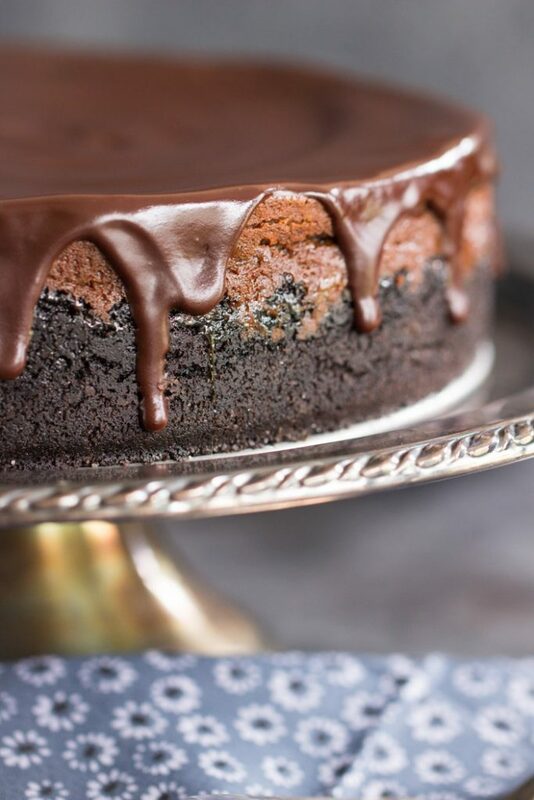 It’s a quadruple chocolate cheesecake altogether, infused with coffee, and smothered in a thick layer of silky, luscious semi-sweet chocolate ganache. 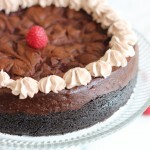 This Mocha Cheesecake is out-of-this-world amazing, and a must-try for coffee lovers! Good morning, and happy Monday! Today is one of those rare Mondays that’s a good Monday because we’ve got a reason to celebrate. Did you know that August is National Coffee Month? I didn’t know, but now that I know, I wanted for us to celebrate, and I made this Mocha Cheesecake in honor of this special holiday!! You guys know I love coffee, and I think I’ve said before that it’s the only thing I look forward to about waking up in the morning. I am not a morning person, but I do go to bed at night excited that at least the morning means coffee. I usually have a few cups when I wake up, then I break for a while, and then I have a cup in the early afternoon. That’s my coffee M.O. I’ve also told you guys before that we have TWO coffee makers set up in our kitchen because my S.O. and I like to prepare our coffee differently, and then S.O. has a third coffee maker that he took to the office and he uses it right at his desk. Not even in the break room, but right at his desk. All of our current coffee makers are 4-cup pots though, and we wanted to have a coffee maker that made a larger pot. 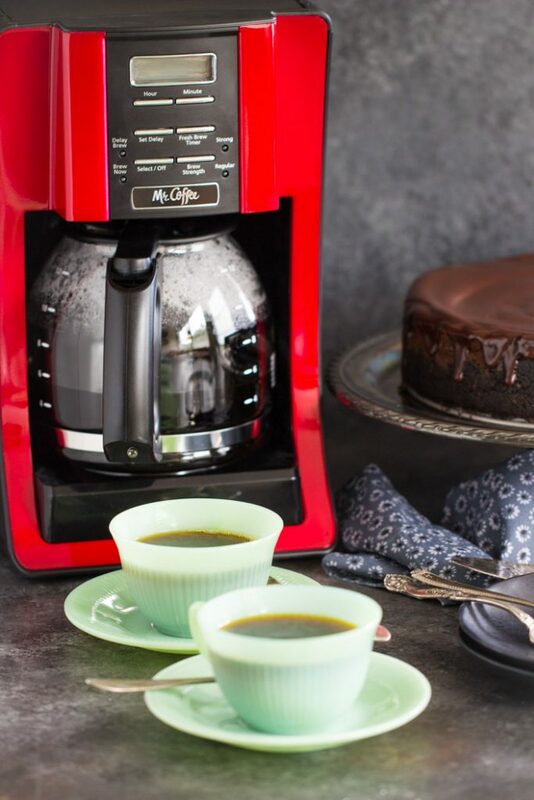 I picked up this Mr. Coffee® 12-Cup Programmable Advanced Coffee Brew Coffee Maker at Walmart, and I was so excited that they make this model in red! It matches all my other kitchen appliances, and I’m quite particular about that. And it was on sale, so that was a bonus! My current coffee maker has an on/off button – that’s it. No features or programming capabilities. My new Mr. Coffee is a big step up. Also, I typically use filtered water from the fridge to make coffee, but this Mr. Coffee has a built-in water filter, so that’s awesome too. Anyway, I’m on my third cup today and it’s not yet 9am. 🙂 It’s producing really smooth and clean-tasting coffee. I noticed a difference right away. 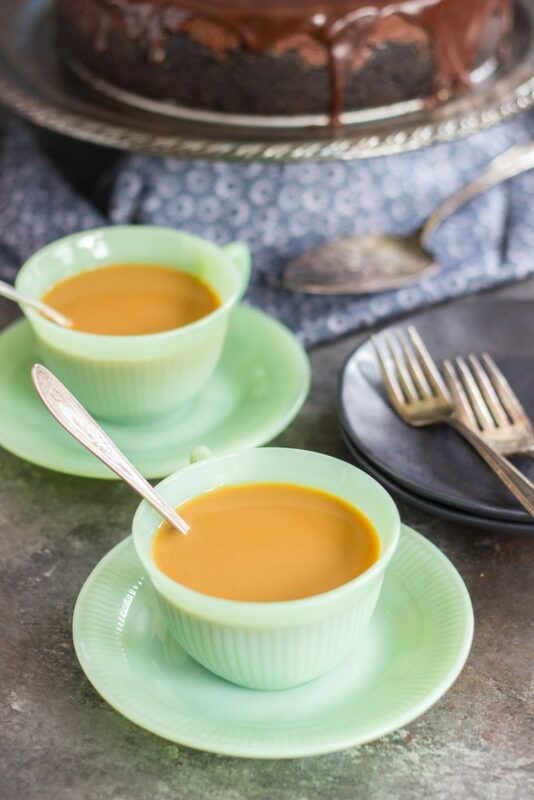 I wanted to create a coffee-infused recipe that will also pair well with a cup of coffee – the best of both worlds! 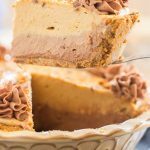 I’ve actually had this Mocha Cheesecake recipe for many years, and I hadn’t shared it yet, but it’s past due! It’s really elegant to look at – has a dark and sinful quality – and it’s sophisticated in flavor, but it’s very easy to make. 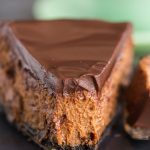 My family and friends love this Mocha Cheesecake recipe, and I even made it for a party at my manager’s house with a bunch of brand new colleagues. That was risky because I really needed to make a good impression, but it was raved about. It’s actually a quadruple chocolate cheesecake on top of being infused with coffee. 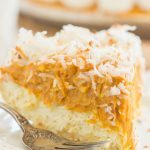 It starts with a thick crust of crushed chocolate creme-filled sandwich cookies, and then the cheesecake batter is my very favorite rich, silky, creamy cheesecake batter. It’s infused with strongly-brewed coffee, melted semi-sweet chocolate, and then I stirred in semi-sweet chocolate chunks for good measure. 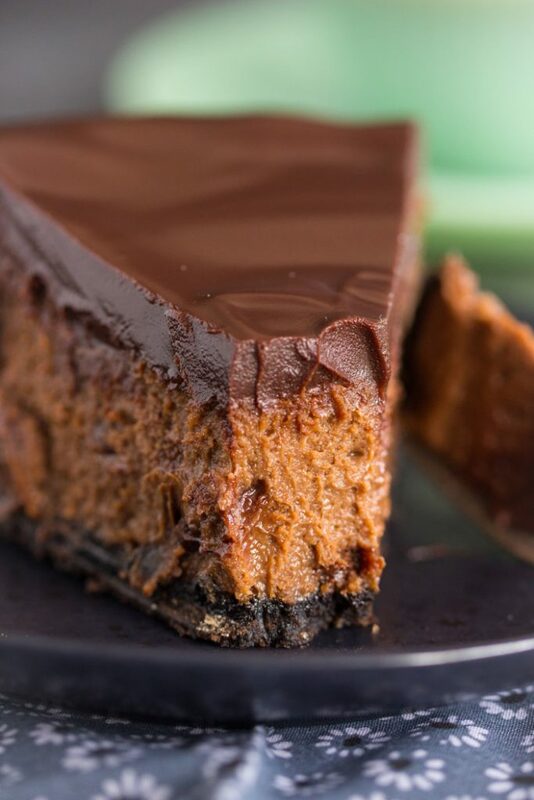 The entire cheesecake is smothered in a generous layer of silky, luscious semi-sweet chocolate ganache. 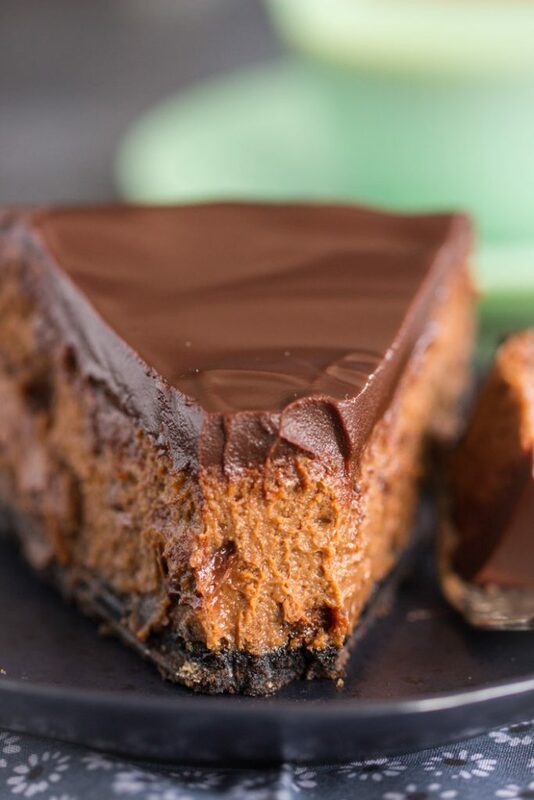 This Mocha Cheesecake is sooooo out-of-this-world. 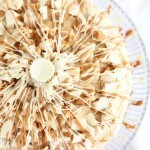 I hope you’ll try this Mocha Cheesecake sometime in August to celebrate National Coffee Month! 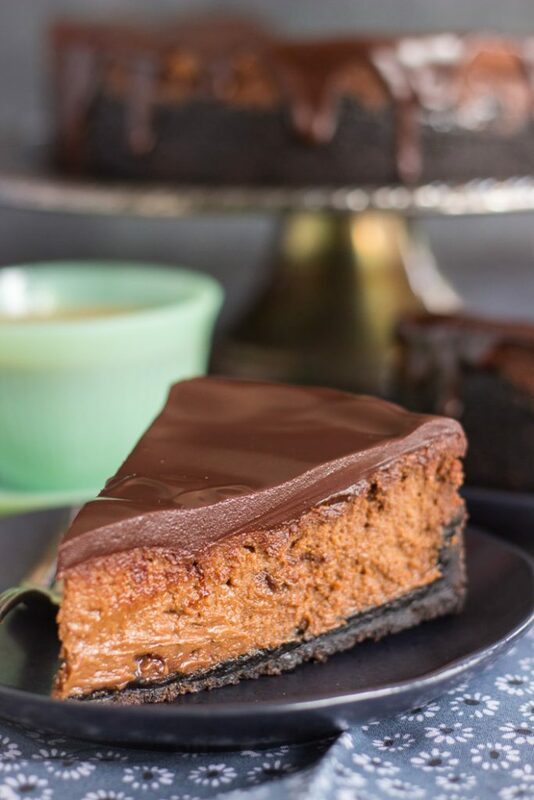 This sinfully decadent Mocha Cheesecake recipe starts with a thick crust of crushed chocolate creme-filled sandwich cookies. 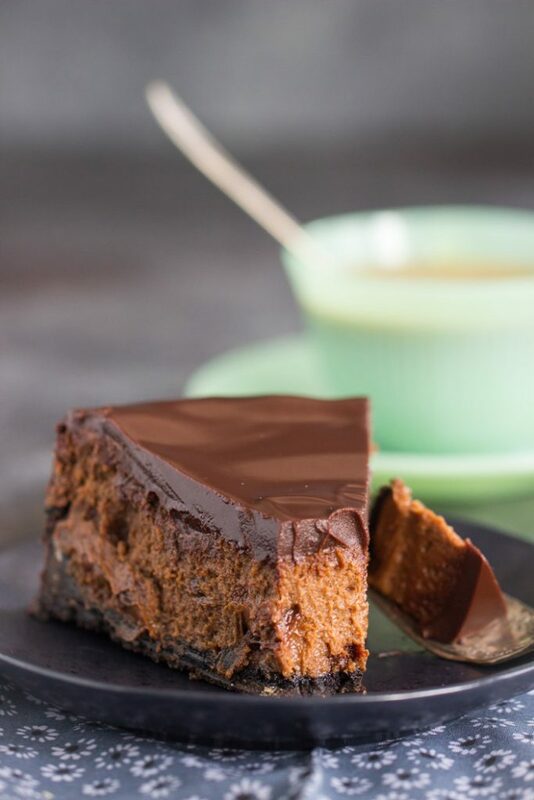 It's a quadruple chocolate cheesecake altogether, infused with coffee, and smothered in a thick layer of silky, luscious semi-sweet chocolate ganache. 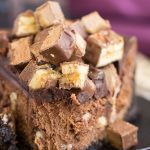 This Mocha Cheesecake is out-of-this-world amazing, and a must-try for coffee lovers! In a food processor, pulse cookies until they are fine crumbs. In a medium bowl, whisk together cookie crumbs, sugar, and melted butter, stirring until combined. In a small bowl or mug, stir together espresso and instant coffee granules, until coffee granules are dissolved. In a small microwave-safe bowl, heat the baking chocolate at 20-30 second intervals, or until melted and smooth. Do not microwave for too long or it risks scorching the chocolate. Use short intervals. With the mixer running on low, drizzle the chocolate into the cream cheese mixture, beating until combined. Bake at 325 for about 70 minutes, or until the center is slightly jiggly, and the edges are golden. In a small microwave-safe bowl, combine the chocolate, heavy cream, and butter. Heat at 20-30 seconds intervals, and whisk until mixture is melted and smooth. Do not overheat or microwave for long intervals or it risks scorching the chocolate and/or cream. Pour ganache over top of the cheesecake, and allow to set, about 15-20 minutes. Baking chocolate is usually packaged in small boxes of 4 ounces each. I used 3 boxes total, and split them between the baking chocolate used in the cheesecake batter, and the baking chocolate used in the ganache. You need 12 oz. total of semi-sweet baking chocolate. 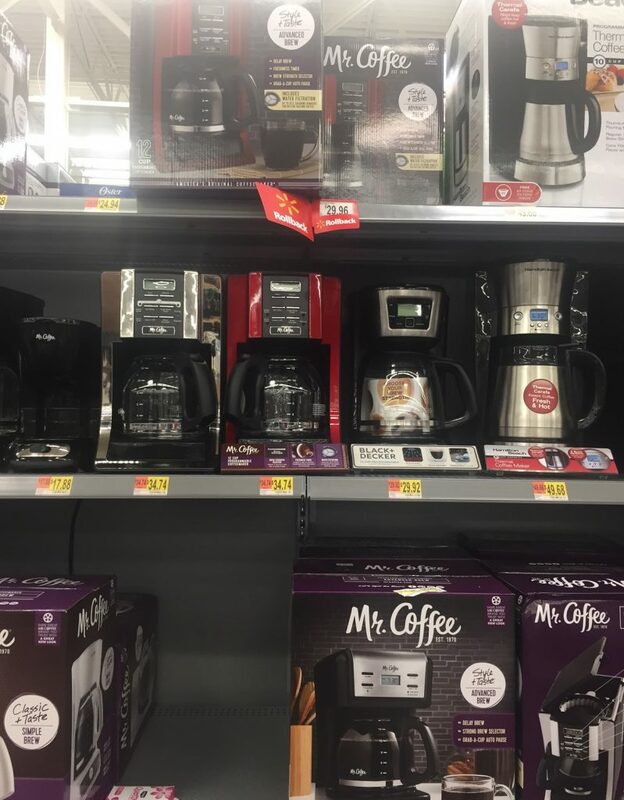 Head to Walmart to save $5 on all Mr. Coffee® Coffeemakers and Espresso Units over $29 and to find Mr. Coffee® Product Demonstrations at your local store! You can follow Mr. Coffee on Facebook, Instagram, Pinterest, and YouTube! 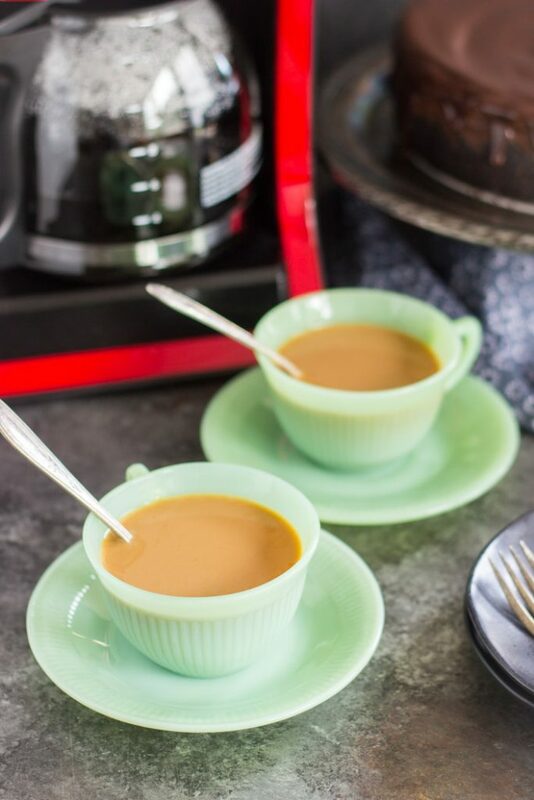 How do you like to make your coffee and what do you use and/or add to it? I’m interested because I have yet to master a great cup of coffee and hearing from a master taster might help! Hi! I’m so sorry I missed this comment! It got lost in my feed. I’ve been drinking coffee since my mom would let me have it after church on Sundays, and I was only like 7 or 8! Lol. I’ve always liked it, and I’ve drank it with cream and sugar at different points, but now I mostly drink it black. It took some getting used to, but now I love it that way, and I like that I can drink it pure and tell whether I like a coffee or not. Coffee is a funny thing, and it does take experimentation to figure out if you like it strong, weak, light roast, medium roast, dark… etc. It’s kinda trial and error for personal preference, I suppose! 🙂 But we clean our coffee makers regularly, and we use purified water!!! It definitely helps! This looks amazing! What size pan did you use? Hi! 9-inch springform. 🙂 It is SO decadent! One of the best cheesecakes I’ve ever had. Please let me know if you try it!! Hi Gina: Are you having trouble view it on the post? What’s the name of the chocolate cream filled cookies? Where can I get them? Are the 2 pkgs. of instant coffee the same as 2 tsp.? I made this cheesecake today. It was delicious! One thing I will say is that I really didn’t taste the coffee in it. I guess I have to find a stronger espresso. Thanks for the recipe. When you pulse the oreos, are you pulsing them with the cream or just the cookies? With the cream! But I don’t use Double Stuff, I use regular Oreos.